ENABLES TWO SOURCES, TO SUPPLY MULTIPLE TV SETS ON TWO DIFFERENT CHANNELS . Use your existing TV remote controls. use for TV distribution in many homes (RG-59); there's often no need to re-wire. Videodisc player - or even a second Digital Satellite Receiver. standard TV set -- similar to connecting a VCR signal as TV Channel 3 or 4. AUDIO AND VIDEO LINE INPUTS for the two video sources. 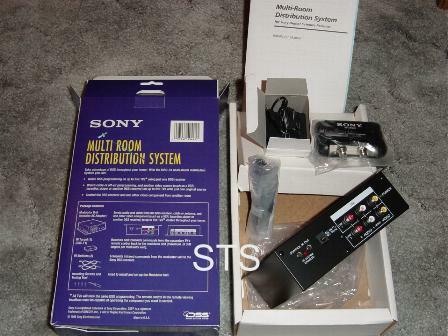 TWO RF OUTPUTS for TV sets less than 50 feet away; can be split to accommodate multiple TV sets. THREE RF OUTPUTS for TV sets more than 50 feet away. HIDEAWAY DESIGN can be placed on a shelf.